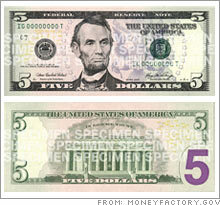 Anyway, someone at the Bureau of Engraving and Printing felt that the five dollar bill unfortunately wasn’t quite ugly enough, so they stuck a big Barney-purple 5 on it (note the carefully-clashing sans-serif typeface—wouldn’t it be great if it turned out to be Arial?). Yes, this seems to be for real. Isn’t that the most jaw-droppingly hideous thing you’ve ever seen? Well, Larry, I don’t like to tell a man his job, but have you ever considered not making all the bills the same color and size? That seems to work pretty well for, oh, every other country in the world. Actually, I know what Larry would say—every American says the same thing when you point this out to them. 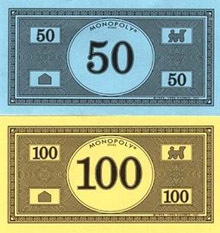 “Monopoly money!” Yes, it’s true. Even a child’s board game has better-designed money than the USA. The original Monopoly design has an appealing simplicity, with slabby serifs and ball terminals in a classic transitional typeface, rather than that ludicrously bloated font on the greenback. The numbers are big and clear. There’s an anti-counterfeiting pattern, and a rather sweet repeated train and house motif—in the real world, those could be little transparent windows in a polymer bill. Heck, the Bureau of Engraving and Printing should just adopt this design as is—after all, Monopoly was invented in the Depression so ordinary people could live the American dream of being property-owning capitalists. And its inventor seems to have stolen the idea. What could be more appropriate? It’s the USA writ small. This entry was posted in Moans and Whinges on 26 Sep 2007 by Mike.